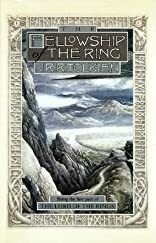 The fellowship of the ring: being the first part of "The lord of the rings"
The Fellowship of the Ring, Being the First Part of The Lord of the Rings, Second Edition was written by J.R.R. Tolkien. The Fellowship of the Ring, Being the First Part of The Lord of the Rings, Second Edition was published by Houghton Mifflin Company.